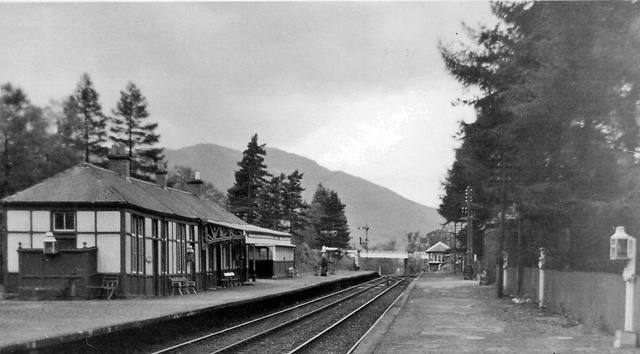 The railway north from Callander towards Crianlarich played a central role in what was to become a National Park. Built in 1866 the line connected Glasgow and Stirling with the ferry ports at Oban as part of the big Victorian dream of connecting the country. The section between Callander and Killin (Glenoglehead) took the railway through some of the most spectacular and remote areas of the southern highlands. Villages along the route thrived with the advent of increased access to bigger markets and the influx of tourists and new villages built to cope with the demand. When a new branch was built to Killin, the old Killin Station was renamed Glenoglehead and promoted as a destination for hill walkers to explore the wild hills around it. The line closed in 1964 as part of the Beeching cuts – the last train left Callander Station with 50 detonators echoing up the line behind it as a final farewell. ‘Whistle’ is a proposed installation which will audibly traverse the former railway line, linking it to its past. A series of steam engine whistles at 0.5 km intervals will cascade up the path of the railway beyond Glen Ogle. Each whistle will trigger off the next at 0.5 second intervals such that the ripple will traverse the entire 18 mile length in 24 seconds. Each whistle will echo and resonate with its own immediate landscape – those in wooded areas will sound very different to those in wider, wilder valleys. As such the piece will have very distinct and different presences at every stage along its route. In clear still conditions it may be possible to hear all 42 whistles – the weather playing as much role in its sound as the topography. As a rapid, linear sound installation, the sounds to a visitor, will draw a visual line along the route from south to north through ever wilder landscapes before fading into the vastness of Glen Dochart. The whistles will be replicas of those on the Stanier ‘Black 5’ engines – the line was run almost exclusively by those engines from the mid 1930’s until the line closure. The whistles on those engines were quite specific and were in turn descended from those designed for the Caledonian Railway company who originally built the line. It’s entirely possible that that whistle sound was the only whistle sound heard on that line. Sound is a very powerful trigger of memory and it is hoped that those who remember the railway in use will have a very powerful personal experience of the piece. The installation will be made from 42 identical units mounted on a 3m wooden pole to be planted in the ground. Each unit will consist of a brass steam engine whistle powered by a small cylinder of compressed air. Triggering will be by RF (radio control) with each unit receiving the signal to sound the whistle then sending on another signal to the next unit with a 0.5 second delay. The simple control circuit and compressor will be powered by a 12v battery and enclosed in a locked, weatherproof box. The initial triggering will either be manually from the first unit, via SMS from a mobile phone, or on a built-in timer on the first unit. Well, there it is all out in the open now. I’m still trying to get my head around the whole 18-mile thing. It’s more than you’d walk in a day. On a clear run it’s a good half-hour’s drive from one end to the other by road. I’d originally toyed with the idea of a shorter run – say from Balquhidder to the top of Glen Ogle as a more realistic target within the time frame and budget. We did the first sound tests there last month and I walked the route surveying the post sites. However, stunning though it may be – particularly as it passes above Lochearnhead and up into Glen Ogle itself – it missed a key bit of narrative. That of the journey from somewhere. It really needed to start out of Callander – where that last train left 50 years ago. Where thousands of visitors pour out of their coaches at the gateway to the Trossachs. That journey up the Pass of Leny and along the entire length of Loch Lubnaig is part of the experience of venturing into the ‘wild’ lands of Breadalbane. The piece is as much about the linear community up the A84 as that tourist experience. To leave off a big chunk of the original vision seemed too much of a compromise and risked losing key parts of the narrative. The plan now is to do a short (2 – 3 mile stretch) as a working test in April with a view to realising the full 18 mile work at a later date. The first sound tests are done, and even at a reduced volume I got some nice echoes off the glen. The first replica whistle has been built and sound matched to a 1930’s original whistle. Within a couple of weeks we hope to have the first one-mile test done on site to check the radio signal strength and hopefully get some good sound recordings to check it’s doing all the things it should. Technical tests are nerve-wracking. it’s where things frequently go wrong and you hope you’ll know how to fix them. Still, one step at a time. One kilometre at a time…. This entry was posted in history, landscape, research, sound, wilderness and tagged art, balquhidder, glen ogle, history, installation art, landscape, loch earn, national park, railway, residency, sounds, tourism, trains, trossachs, views. Bookmark the permalink.